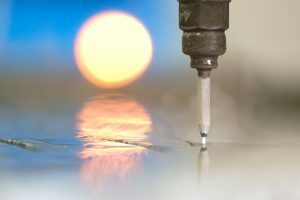 Waterjet cutters are powerful machines, and quite efficient compared to many other cutting techniques. We at Hydro-Lazer favor the waterjet because of its accuracy and efficiency, and we also understand that it’s always possible to coax a little more efficiency out of your machinery. Here are some tips from us on how to get the most efficiency from your waterjet cutter. A major advantage of waterjet cutter is their combination of precision and power. They’re strong enough, in fact, that in many cases, materials can be stacked and cut simultaneously, effectively boosting productivity. In most cases, waterjet machines can cut up to 0.6 inches in depth. Important for optimizing productivity is having a workspace suited to what you are producing. If you know what you will be producing, base your table size around that. If you aren’t sure, we recommend choosing something around 2 by 4 meters, which will be well suited for most jobs. There are a variety of different water projection systems for waterjet cutters. Some are dual-head systems, which split the water stream. Operating these systems is more complex than using a higher power, single head system. At the end of the day, the decision should be made based on your capacity to operate it, but knowing that there are options can make a world of difference. One of the best things you can do for your waterjet is to take good care of it. Fortunately, the kind of wear that these machines face is easy to predict and can be easily prevented or repaired as needed. This will keep your maintenance costs down and your productivity up. Your team here at Hydro-Lazer are your waterjet cutting pros, and whether you need something small or large, we can cut it for you. From tile and stone flooring inlays to cutting rubber, plastic, and steel, we can cut almost any material with ease. Contact us for more information today!